Tailored masterclasses for the screen sector, taught by industry professionals at Miramar Creative Centre. The “Pohewa” courses (meaning 'to imagine or create' in Te Reo Maori) have been established in partnership between Miramar Creative and Wrestler and are designed to meet the market in terms of an identified need both from organisations and individuals for a specific practical skill set. 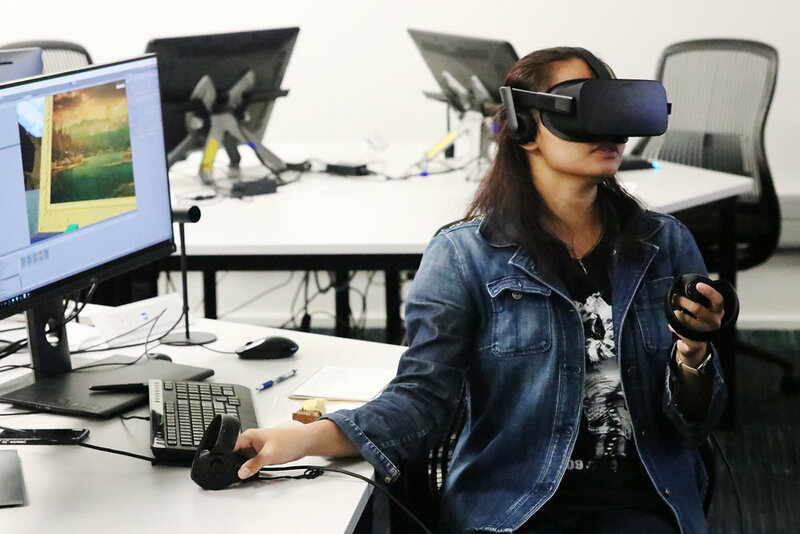 The first of a range of master classes was focused on VR and AR content creation, where students spent two days learning the fundamentals of this ground breaking medium, leaving after the second day with a VR asset that they each created themselves under the guidance of some of the best and brightest industry mentors. The Pohewa courses are housed at the Miramar Creative Centre, set up as a collaboration between Miramar Creative Limited, Victoria University of Wellington and the Local Screen Sector. The state of the art facility has been custom built to meet the ever expanding needs of the creative industry – providing a destination for learning and industry connectivity that is not available anywhere else in the world. Our point of difference with our Pohewa offering is that we can move quickly to develop course content based on the needs of the industry. When Kat Lintott and Kristy Grant met a year ago, it was to talk about where we could go an learn about IP and Commercialisation, Creative Entrepreneur and Business Strategy skills – specific to the Creative Tech and Screen Sectors. After some research they established that these courses didn’t currently exist, so decided to set them up themselves. Kristy is a passionate ambassador for sharing knowledge – especially when it relates to the screen sector in Wellington. After creating the Roxy5 short film programme for intermediate and high school students in 2014 with Jamie Selkirk, it became quickly apparent that the pipeline should continue and the same sort of supportive, practical learning environment was needed for tertiary students, those looking for professional career development opportunities and screen enthusiasts in general. So Kristy and Jamie partnered up with Victoria University of Wellington to establish the Miramar Creative Centre in Park Road Miramar – right in the centre of the creative sector. Kat is making and encouraging content that is adding to society, giving viewers who are coming out of these experiences the feeling of empowerment to be part of the real world too. Her particular interest is in creating content with strong female and culturally diverse characters. New Zealand Film Commission has funded her two main projects, one focuses on empowering your inner feminine by dancing with Goddesses, and the other is exploring traditional Maori storytelling with modern Maori storytelling. Previously, Kat worked at 8i as their Chief Communications Officer and has spent two years on the NZ VR/AR Association Executive Committee. Jamie is one of the pillars of the Miramar screen sector, having set up the majority of infrastructure, studios and facilities that provide the foundation of the film industry in Wellington – so who better than to also establish a creative learning facility in Miramar. Jamie also created the Roxy5 programme and helps mentor the teams involved to encourage future film makers and creative entrepreneurs!Also as Co-Founder and Co-Owner of Weta Workshop, Jamie has been involved with dozens of successful local and international films created in Miramar, working both as Editor and Producer. Jamie won an Academy Award for his work as Editor on Lord of the Rings - Return of the King.